UK telecoms regulator Ofcom has published its long-awaited decision on the upcoming 2.3 GHz and 3.4 GHz bands, and Three is not happy. The main issue in question wasn’t the mechanics of the auction itself, but rather the matter of how much spectrum each mobile player should be allowed to have. Three has long argued that the spectrum situation in the UK is imbalanced with, coincidentally enough, Three not having enough of it. The fact that most of this spectrum, bar the stuff Three was given when it formed, was acquired in fair and open auctions doesn’t seem to mitigate Three’s righteous indignation. Three wants there to be a cap of 30% of available spectrum owned by any one company. 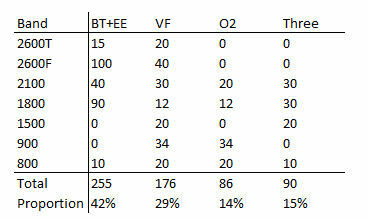 EE/BT currently owns 42% of usable spectrum (see table) so such a ruling would require stripping it of a hell of a lot. It would also severely restrict Vodafone’s participation in future spectrum actions. Three is, in effect, asking Ofcom to embark on a campaign of aggressive spectrum wealth redistribution. Ofcom seems have resisted any Marxist inclinations it may have and decided to chart a middle ground, as indicated last year. It has placed a cap of 255 MHz of immediately usable spectrum, which includes 2.3 GHz and means EE won’t be able to bid for any of the 40 MHz of it on the table. Ofcom has also imposed a cap of 340 MHz on the overall amount of spectrum owned by any one company after the auction of 150 MHz of 3.4 GHz spectrum (37% of the new total, also including yet-to-be auctioned 700 MHz spectrum), meaning EE will be able to win no more than 85 MHz of it. So far so good for EE. The company never expected to have much of a shout at the 2.3 GHz band and as you can see from the table it already has plenty of spectrum at similar frequencies. The thing EE’s Ofcom lobbyists will be looking for urgent clarification on, however, is the status of the cap when the 700 MHz becomes available. EE has very little low frequency spectrum, which is especially handy for rural coverage, and would presumably want to get as much 700 as possible. If the cap is going to remain in place for that, EE is likely to be reluctant to eat too far into its allowance with 3.4 GHz, which will only be used for 5G anyway. EE CEO Marc Allera, who must be pretty happy with the outcome, sensibly kept his cards close to his chest on the matter. “While we don’t agree that spectrum caps were necessary for this auction, our focus remains on investing in our network, using our existing and future spectrum to provide the best mobile experience for our customers across the UK. We look forward to bidding for additional spectrum in this auction,” he said. Another reason Dyson and Three are failing to receive the sympathy they clearly feel they deserve will be the recent acquisition of UK Broadband, one of the few other companies to own any other UK spectrum. “After acquiring UK Broadband in February, the operator Three has access to 40 MHz of mobile spectrum in the 3.4GHz band, plus 84 MHz in the 3.6 to 3.8GHz band,” said Ofcom in the rationale behind its decision. It also flagged up the 1400 MHz spectrum Three got off Qualcomm a couple of years ago and we understand it views Three’s cash position as strong. We called Ofcom’s initial statement on this issue a fudge, but in hindsight the middle course seems to be the most sensible option. Three tries to infer that its spectrum position is the result of some intrinsic unfairness in the UK market but the facts just don’t support that. 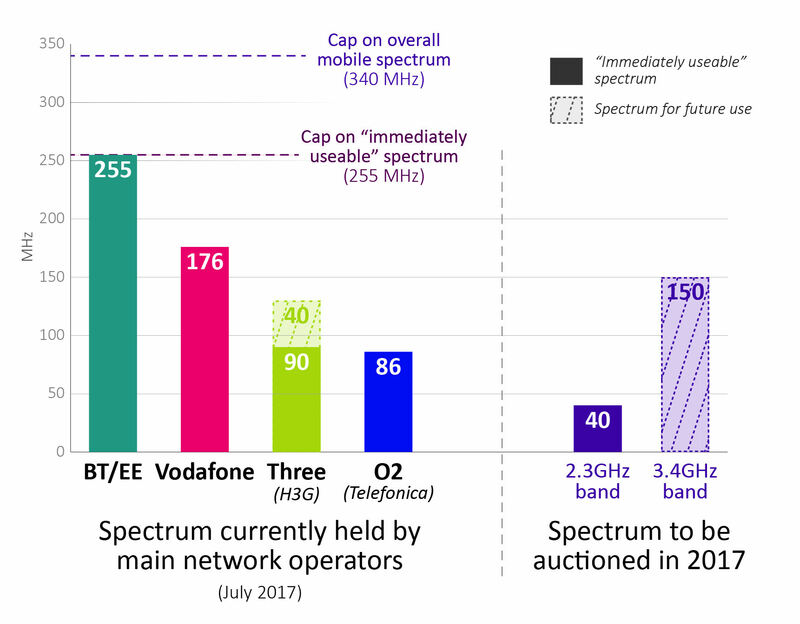 EE won its spectrum at auction fair and square and intervention to reverse that process would set a very worrying precedent for future auctions and the UK mobile market in general. We have some sympathy for any claim that Orange and T-Mobile should have been required to give up more spectrum as a condition of their merger to form EE but what’s done is done. Three still has plenty of spectrum and the opportunity to get loads more if it splashes the cash for a change. Three’s main response to the Ofcom consultation was to claim it is capacity-constrained but if that’s the case how come it just started offering unmetered Netflix streaming? Here’s hoping Three will finally realise it’s likely to get more ROI from actually competing rather than moaning, but we’re not holding our breath. Ofcom has summarised the current UK spectrum landscape situation in the table below. Why are OFCOM not considering shared spectrum for 150MHz 3.5GHz. The US are doing this with the CBRS R&O from the FCC. This seems a much fairer way of using this national resource and will spur much faster innovation in the area of low cost fixed and mobile broadband connectivity. This strategy coupled with advances in core virtualization, roaming strategies, decreasing cost and increasing in equipment capability mean that many new players can deploy fixed and mobile networks. This ultimately brings more choice and lower costs to the consumer. Licenced spectrum just feeds the inadequate status quo.